At 1 a.m. Jon and I are awoken with a start. Something big is crashing unsteadily up the stairs into the shelter. Bear! my sleeping mind screams. I sit up quickly, throwing my sleeping bag off my face, and grabbing Dobby as he begins to bark madly. I look up and am blinded by the light from a headlamp pointed directly into my eyes. “Sorry, I’m Growler,” the headlamp says. Since bears can’t talk I grumpily lie back down and am asleep as soon as my heart calms and my head hits the pillow. When we wake up for real I formally meet Growler, whose toned physique hints at much more hiking than just the miles of the Long Trail. We learn he just finished the Appalachian Trail and after experiencing a vendetta against Vermont has come back to conquer even more of the state’s trail system. This will not be the last time we hear an AT hiker express dislike toward the Vermont portion of the trail. Growler apologizes for his overnight arrival, explaining he had attempted the night before to reach the same road we walked along yesterday. This resulted in Growler climbing to the summit of Camel’s Hump the previous night in the dark but bailing on his destination when he reached the shelter where we stayed the night. He warned us that the climb up and down Camel’s Hump is very sketchy and wet, so we have that to look forward to today. Jon and I don’t leave camp until almost 10. I could blame Dobby, who does his best to remain asleep when I attempt to wake him, but Jon and I are both feeling that 16-mile day yesterday. We are already in Camel’s Hump State Park, and we begin to ascend toward the summit. At 4,081 feet, Camel’s Hump is the third-highest mountain in Vermont and the highest undeveloped peak. I look at the cloud-covered summit high above us with trepidation. Growler’s words and memories of climbing the wet rock walls of Mount Mansfield drift through my mind. We noticed an alternate trail around the side of the summit when I looked at the map this morning. I turn to Jon and mention the alternate route. Silently I hope he doesn’t think less of me for not wanting to reach the summit. I have no desire to make that climb knowing that I won’t even be rewarded with a view at the top. Surprisingly, Jon agrees, and we decide to take to Alpine Trail. This trail branches off the Long Trail about a mile north of the summit, traveling along the east side of the mountain before reconnecting with the Long Trail just south of the summit. We reach the bottom of Camel’s Hump and the Montclair Glen Lodge around 3 p.m. Since we have plenty of daylight left and our minds set on reaching the town of Waitsfield tomorrow, we decide to push on another five miles to Cowles Cove Shelter. After making a pit stop at the privy and pulling up my shorts, I feel a sharp pinch on my hip. I pull my shorts back down in time to witness a centipede (Or millipede? There were a lot of legs.) doing its best to take a chunk of my skin off. I yell, ripping the insect off, and throwing it into the undergrowth. The next summits are Mount Ethan Allen and Mount Ira Allen. Though not 4,000s, they are not to be disregarded at 3,688 and 3,506 feet respectively. Scaling Mount Ethan Allen takes longer than expected, and we start to get nervous about the amount of daylight we have left. Once over Mount Ira Allen, we feel in a much better place. Before reaching Burnt Rock Mountain we cross Ladder Ravine. 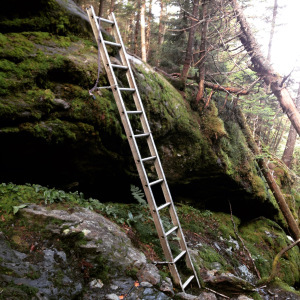 Ladder Ravine is aptly named for the ten-foot aluminum ladder you must climb to exit the ravine on the south side. Dobby is unable to climb ladders and there is no possible way for him to climb around the sheer rock wall. I straddle Dobby and place his feet on the ladder rungs, holding him up by the handle on his Ruffwear pack. As I climb the ladder one rung at a time, pulling him up in front of me, Jon pushes his back feet up. The process is slow but successful. I don’t know how I would have accomplished such a feat without Jon. All that is left between us and camp is Burnt Rock Mountain, a barely noticeable blip on the elevation profile that shows less than 100 feet of elevation gain to reach the summit at 3,168 feet. Never trust the elevation profile. We are forced to climb a rock with nothing but a rope to hold onto. Jon goes first and hits his knee, cursing, and throwing his trekking poles. A nervous laugh escapes me; I’m unsure of what else to do in our deteriorating situation. I don’t trust the rope. I don’t trust my ability to climb this rock with nothing but the surety of my footsteps and my upper arm strength to keep me from falling. Maybe without a pack on this task wouldn’t seem so daunting. Somehow Dobby jumps up the rock with only a slight boost. That dog amazes me. I effectively crawl up the rock face, using the rope as a safety net but trying my best to climb with hands and feet in small indentations. Once on top of Burnt Rock Mountain, my worst fears are realized. The summit is small and bare, but in the darkness, it seems the trail traverses it forever. My headlamp barely works; Jon puts fresh batteries in his and we both walk by its light. We walk along sheer drops and in the night we cannot tell how far the drops go. I feel as if I could slip and fall, and keep falling into an abyss with no end. Jon turns back to me and warns me that he just crossed a rock bridge, approximately three feet wide with drops on both sides. He tells me it looks longer than it is, just three or four strides and I will be across. My will focuses on him, on his voice, trusting this man I just met, and before I know it I’m across. We will go back to this mountain, this place that made me feel utterly defeated and horribly afraid. I want to see sunlight shine on that summit. I want to prove to myself that the monsters will disappear in the light of day. On the descent, Jon and I regale each other with depictions of our favorite fast food restaurants. Food is a common topic on the trail because we are always hungry. We are both from the north but since I have also lived in the south I have tales of Chic-fil-A, Zaxby’s, and Bojangles’ with which to feed his mind. From the summit, the trail takes a drop down from some rocks. Dobby decides he cannot make this drop. I climb back up to coax him down, and he leaps from the top just as I reach him. I turn to follow and slip on loose stones, my knee crashing into a boulder. A stream of curses passes my lips. We limp into camp at 9 p.m. after four hours of night-hiking with one good headlamp between us. The last five miles took us over five hours. There is a Canadian couple staying in the Cowles Cover Shelter but they make room for us as we approach. Jon and I are delirious as we make dinner. We attempt exhausted conversation with our new friends Shay and Elise. We giggle uncontrollably and barely have the energy to feed ourselves before collapsing into our sleeping bags.